The problem of value erosion is not only a national but also an international issue today. In the past, religions prescribed moral and ethical values and people; followed them generally, even if some people flouted them. Being based on authority of a holy book or person they could not be questioned but had to be simply obeyed. With the advancement of modern science and critical enquiry, religions lost that power and moral values lost their hold on millions of people, especially under the force of the philosophy of materialism upheld by many scientists. 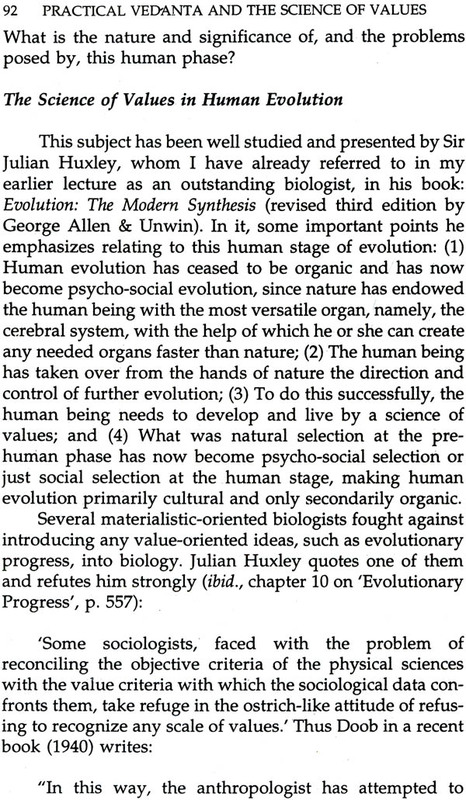 But the science of biology today advocates the need for values in the human phase of evolution of which, as Julian Huxley says, the human being has now become the Trustee. No physical science, however, has knowledge of the source of the science of values. 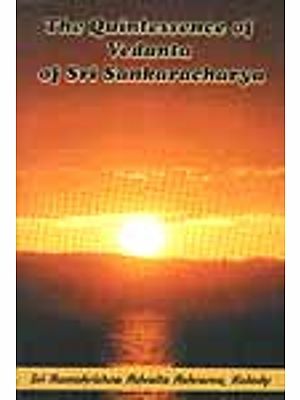 The present book deals with these problems very lucidly and rationally and presents India's answer to these problems through its philosophy of Vedanta which proclaims that the science of values is the link between the physical sciences and the science of spirituality. The problem of value erosion is not only a national but also an international issue today. In the past, religions pre- scribed moral and ethical values and people followed them generally, even if some people flouted them. Being based on authority of a holy book or person they could not be ques- tioned but had to be simply obeyed. With the advancement of modern science and critical enquiry, religions lost that power and moral values lost their hold on millions of people, especially under the force of the philosophy of materialism upheld by many scientists. 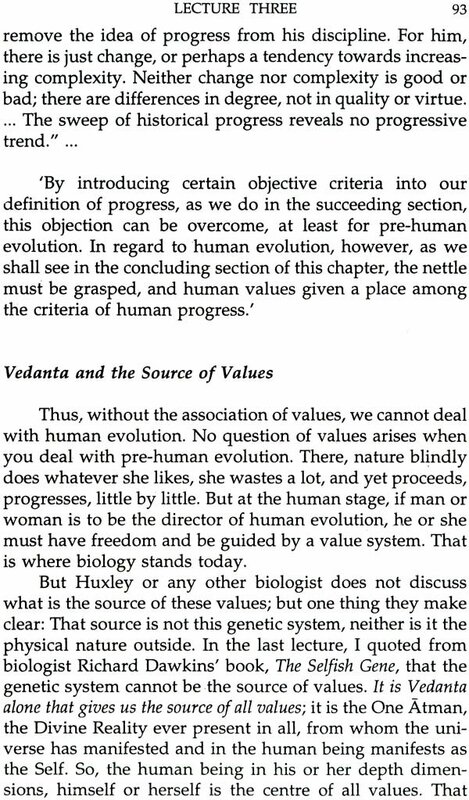 But the science of biology today advocates the need for values in the human phase of evolution of which, as Julian Huxley says, the human being has now become the Trustee. No physical science, however, has knowledge of the source of the science of values. The present book deals with these problems very lucidly and rationally and presents India's answer to these problems through its philosophy of Vedanta which proclaims that the science of values is the link between the physical sciences and the science of spirituality. 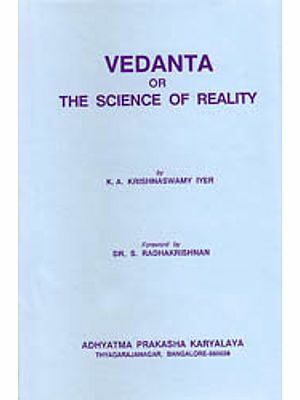 The book is based on the cassette record of four lectures delivered by Revered Swami Ranganathanandaji, Vice-President, Rama- krishna Math and Ramakrishna Mission, on Practical Vedanta and the Science of values on four consecutive Sundays starting the 9th August 1992 at Ramakrishna Math Vivekananda Auditorium, Hyderabad, India. The author expects that other thinkers will come forward and contribute further to this important subject on which depends the very survival of human culture. The publisher hopes that the book on an important subject of supreme relevance to humanity will be welcomed by readers everywhere.